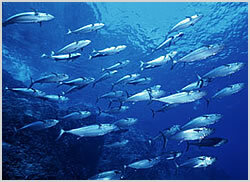 The name comes from the large schools of Dogtooth tuna that can be found cruising along the drop off. The reef consists of coral gardens, walls, overhangs and ledges down to around 40 meters before it plunges into the abyss. These ledges are great places to spot resting whitetip sharks and there are several cleaning stations to be found. The elusive Sunfish has been known to put in an appearance here.